It’s amazing what a shower can do for a new mom, isn’t it? I truly feel like a new woman after getting a shower and taking some time for myself. And although I don’t have the time (or reason) to get all dolled up everyday, I still make it a point to get dressed and do a few things that make me feel more human. 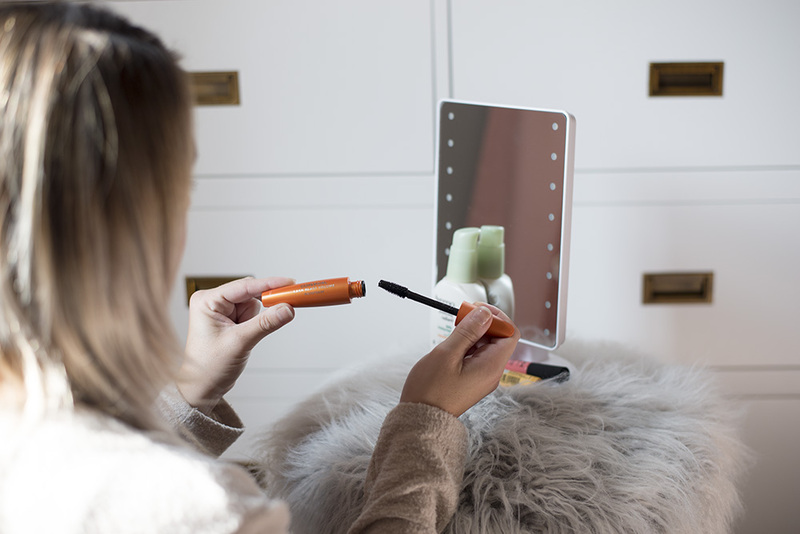 I’m all about a quick morning beauty ritual (I mean I kind of have to be when I have to get three kids out the door!). But there’s actually something liberating about a more simple and natural look. And not putting 900 different products on my face and in my hair because duh then I have to take it all off later, right? 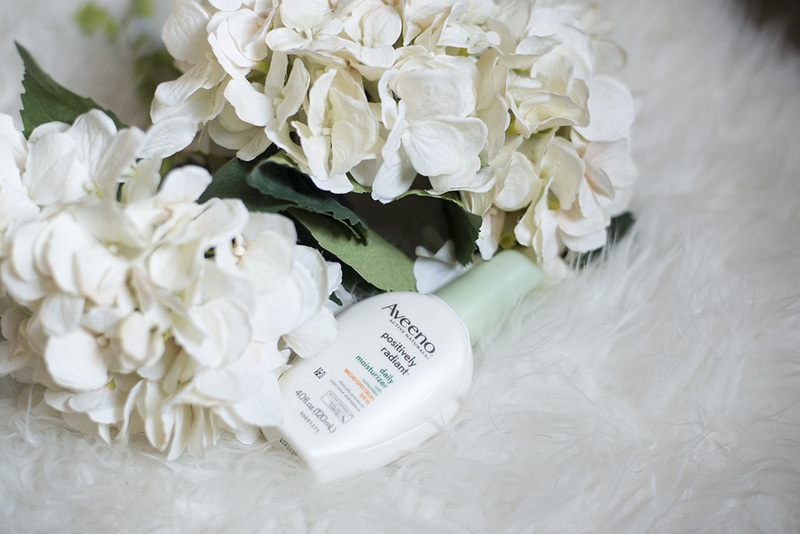 So over the past few weeks, I’ve been keeping it simple when it comes to my beauty ritual. 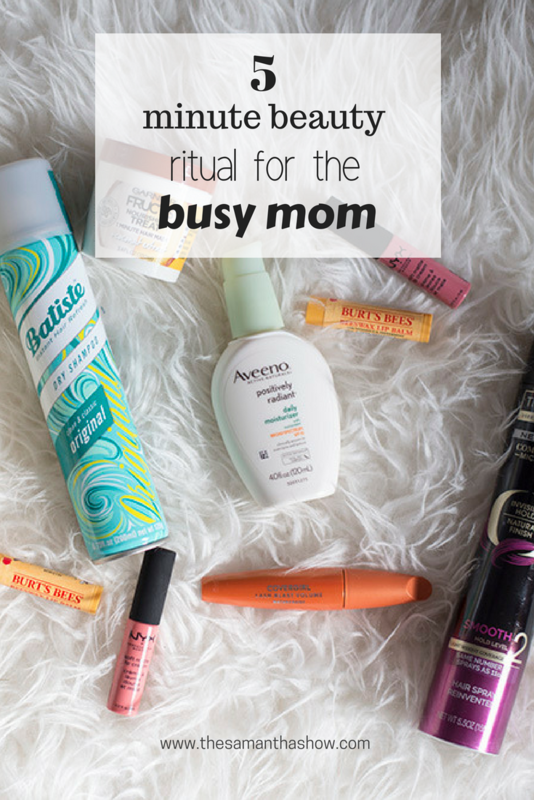 Here are some of the products I’ve been using for my 5 minute beauty ritual for the busy mom! All of the items can be picked up at Meijer! 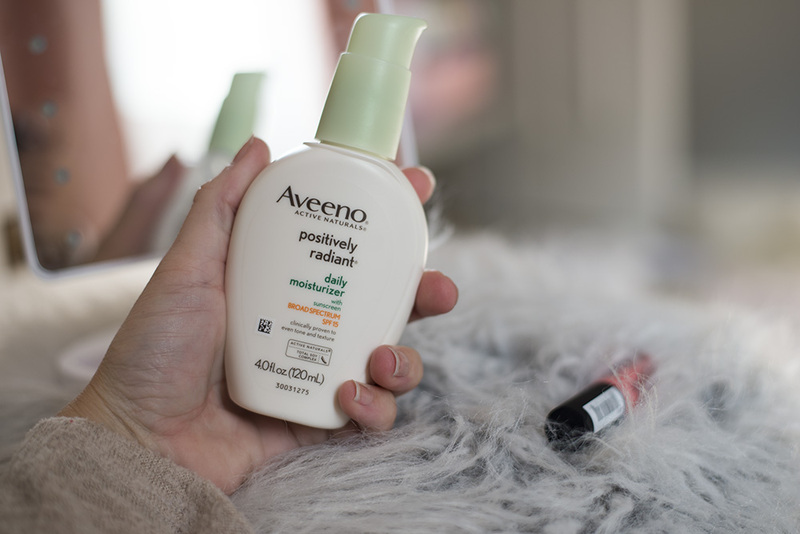 Aveeno Positively Radiant Moisturizer: My face gets super dry; like I need to put face lotion on immediately after exiting the shower or I feel awful. One of the best parts of summer is that beautiful tan, glowing skin, right? So I’ve found that this moisturizer enhances that glow and puts back all of the moisture I’ve lost. It’s also super lightweight and doesn’t leave a sticky, thick feeling. Burt’s Bees Lipbalm: I’ve been using these since high school and they’ve always been my ride or die. I love lipstick just as much as the next lady but when I’m just running out to the doctor or gymnastics class (because let’s be real that’s really the only places I’ll attempt to go with all three kids alone right now), chapstick is all I need. 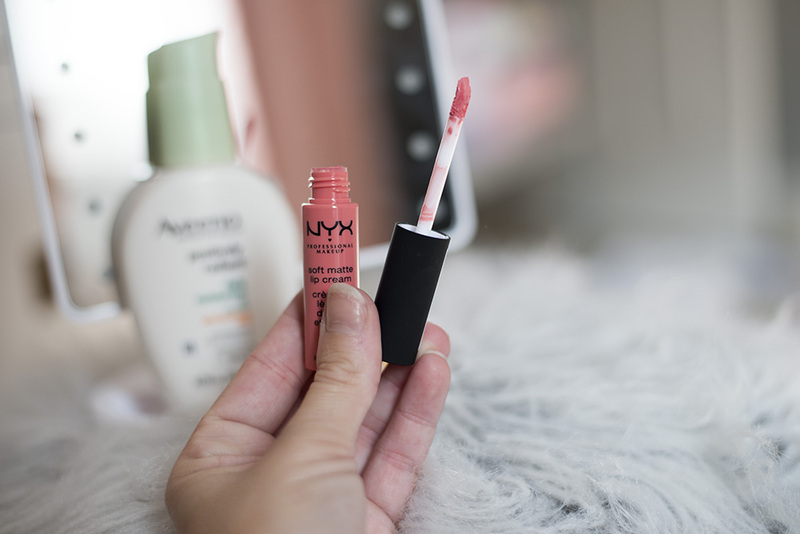 NYX Matte Liquid Lip: If I’m feeling a little drab and want a little pop of color, I love these lippies. I love these light pinks because they’re pretty neutral so they still look very natural. Batiste Dry Shampoo: Because what’s a shower these days? 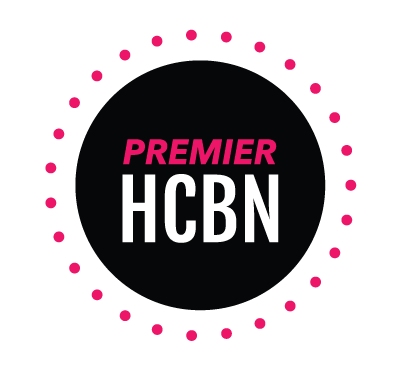 Even when I’m not raising a newborn, I only wash my hair every 2-3 days. My hair is super dry so my hair is much better off when I only wash it every few days. This helps my dry locks retain the good oils it needs. But seriously, this dry shampoo is life. Pro tip: spray some on before bed so it can absorb the oil overnight. 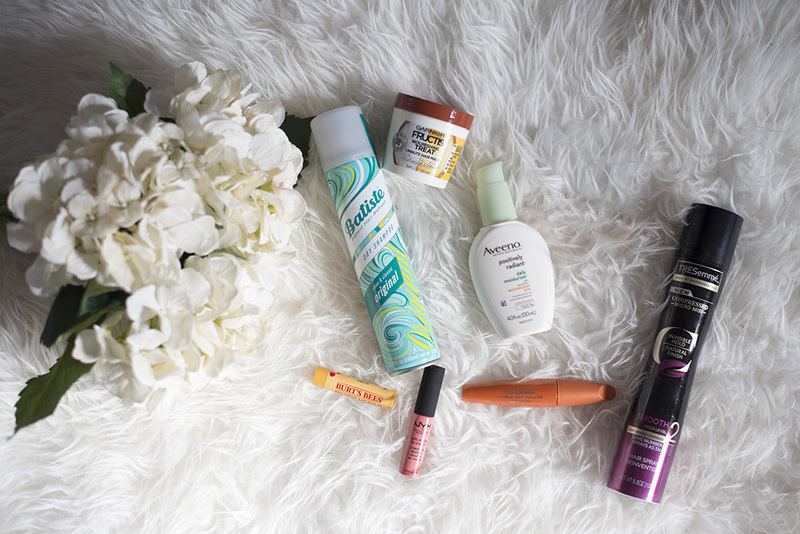 Garnier Fructis Nourishing Treat: Postpartum hair loss/breakage is real. Either that or my natural blonde locks *that I pay for* have just had enough and have decided to snap right off. So doing a little hair treatment for some extra TLC is a game changer. It’s also only a one-minute treatment so it fits into my busy schedule aka the 5 minutes I have to myself before someone barges into the bathroom. Covergirl Lash Blast Mascara: This is a MUST for me. At the very least, long and luscious lashes give you that “awake” look, even if you only slept 4 hours after waking up with a fussy newborn. But newborn or not, mascara makes it look like you put a ton of effort in when really it was one simple step! If you skip the rest of the products, don’t skip the mascara. 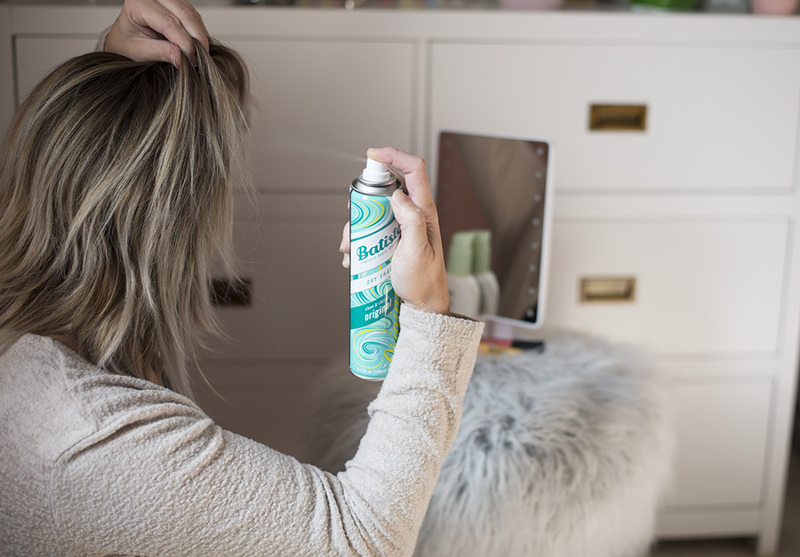 Tresemme Compressed Hairspray: And last but not least, hairspray. Because of that postpartum breakage, all the baby hairs fall out of my mom bun when I throw it up with 5 minutes to spare. So a little hairspray and voila, mama is put together and ready to roll! You can grab all of these items at Meijer and simplify that beauty ritual babes!. Natural is beautiful right? And you know what else is beautiful? Getting out of the house on time (or less late than normal) and still feeling beautiful and good about yourself. What types of products do you use when you’re going for a simple and natural look?